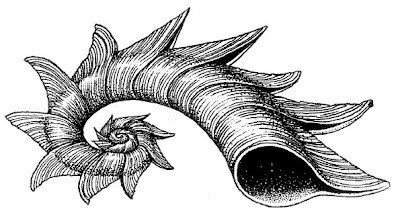 The Lower Carboniferous gastropod Phanerotinus cristatus. Figure from Knight et al. (1960) [Treatise on Invertebrate Paleontology pt. I]. About two weeks ago, I started putting up a series of very brief posts, each figuring and giving characteristics of a particular taxon. There was a point to doing so: if you were to ask me what was the number one issue in most people's understanding of biodiversity, I would say that most people have no idea just how much of it there is. Indeed, there is so much that it might just be incomprehensible. The short posts allowed me to exhibit more variety of organisms than I could in my usual longer posts. However, a couple of readers voiced concern that the more detailed posts (which they preferred to read) were being lost in the mix. Their point has been noted, and granted. Which is why, with the welcome assistance of Field of Science's puppet-master Edward, I have launched the Catalogue of Organism's new sister blog, The Variety of Life. The short posts will be put up there, and it is my hope that over time I can build it up to a useful guide to the diversity of (at least some) organisms that inhabit, or have inhabited, our world. Meanwhile, Catalogue of Organisms will continue in its previous fashion, bringing you in depth discussion of matters systematical (at least as far as I am able). I hope that both sites will please at least somebody. That's great news, Christopher. I do see the value of both kinds of post, but now that you say this I realise clearly that my issue was indeed that I didn't think they belongs in the same place. I'll continue to religiously follow COO, which teaches me more than almost any other blog I know. Excellent. I must say I love your longer posts because they provide interesting details about taxa I'd never bother researching myself, while your new short ones are mostly just character lists, which are dry and uninteresting unless it's some clade I know well.